Rene-Thierry Magon de la Villehuchet committed suicide after losing $1.4 billion. The 65-year-old founder of Access International Advisors, a hedge fund, invested client money with Bernard Madoff, who confessed to concealing a $50 billion Ponzi scheme last week. Found dead in his 22nd floor office on Madison Avenue this morning, Villehuchet's wrists were slit with a box cutter, and he also took sleeping pills. No suicide note was found. He would be the first investor that Madoff defrauded to commit suicide. Although married, he had no children. Investors in Access International are primarily European and include a Rothschild unit and clients of UBS. Madoff's record was considered so exceptional that Access set up a fund that invested only with him called Luxalpha, which is where the losses are concentrated. The total asset base of Access was $3 billion in September, making the Madoff loss almost half of its investor capital. Despite Villehuchet's huge loss, other investors lost even more: hedge fund Fairfield Greenwich Group put $7.5 billion into Madoff. 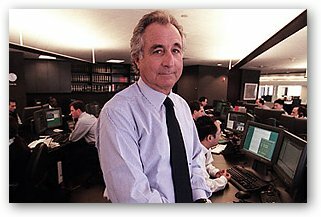 Madoff's Ponzi scheme operated by paying old investors back with the money raised from new investors. He is currently under house arrest at his Park Avenue penthouse.